Well, friends, it’s already July! How is your summer going? We have had a summer full of slippahs (flip flops), sunscreen lathering, sandy bottoms, scraped knees, library visits, hikes, movies and capering about! Summertime is my favorite time of the year! Even in Hawaii where it’s summer 365 days a year! There’s just something special about summer. I remember the excitement I felt when the last school bell of the year rang and we darted out of the school like there was a $1000 dollars waiting for me in my moms car to kick the summer off. I loved it! I think Olaf and I have the love for summer in common! I had a friend who home-schools her children ask me yesterday when school started up again and if I was excited. I found myself actually feeling bummed out when I told her school starts back up in less than a month. She noticed I didn’t say that with a smile on my face and asked me why??? She said, most of her friends can’t wait for school to start. They were ready for a break from their kids by now. I guess I’m a little odd in that I sincerely LOVE to have my kids home with me! They really are my best friends and the more time we can have hanging out together, the better! Yes, I’m saying this about a month and half into summer break! No, I’m not crazy…well, maybe a little bit at times-especially before my morning coffee. Believe me-it hasn’t been all smiles and rainbows this summer, but I still love having them home! I enjoy watching my kids experience new things and love to see them experiencing something new. We move so much with the military that it seems like there is always something new to do and summer is the perfect time to do it. We don’t plan any sports or camps and we keep the summer as open as we can to just explore! At the beginning of the summer, I have each kid make a summer “bucket list.” This is where they can tell me the stuff THEY would like to do over summer break. Now, those are quite the lists! I can’t help but wonder what would be on YOUR lists! I realize that unstructured play time is very important for our kids and wanted to make sure we had plenty of that as well. We needed a good balance of relaxing, playing at home and exploring our island. Now, that we are getting to the end of summer (not quite, but it feels like it now that we entered July), I wanted to take a peek at our bucket lists and see how we are doing. Well, here is what we still need to do: ride a horse, hike Diamond Head, go to the Children’s Museum and drink coffee. Yes, I’ve had coffee this summer. But, as I mentioned before, I get a little nutsy coo-coo if I don’t drink it in the morning so I kept it on the list! We still have a few things left to do. But, I feel we’ve had a great summer so far. It has also been important to keep our family centered with Christ throughout the summer. It’s easy to get caught up with the “bucket lists,” the BBQ’s the camping trips etc. But, I don’t want to teach my kids that it’s okay to put church on the back-burner during the summer because it’s convenient. My faith is important to me 24/7, 365 days a year. Even with a busy summer, I model this to my kids by starting each morning with a devotion and sometimes even bible journaling. For us, keeping God at the center of our summer has made such a difference in our summer. I know, for me, I feel much happier and patient when I start my morning off by reading the Bible. I’ve seen a change in my kids’ behavior on the days they do too. Keeping our island beautiful is something else I’m committed to. This summer we have volunteered as a family with a group called Sustainable Coastlines for a beach cleanup. We’ve helped 808 Cleanups by picking up trash along Kokohead when we hike it monthly. We also have a cleanup hike scheduled for later this week with our kids hiking group. We have a few weeks left of summer and we are going to make the most of it! 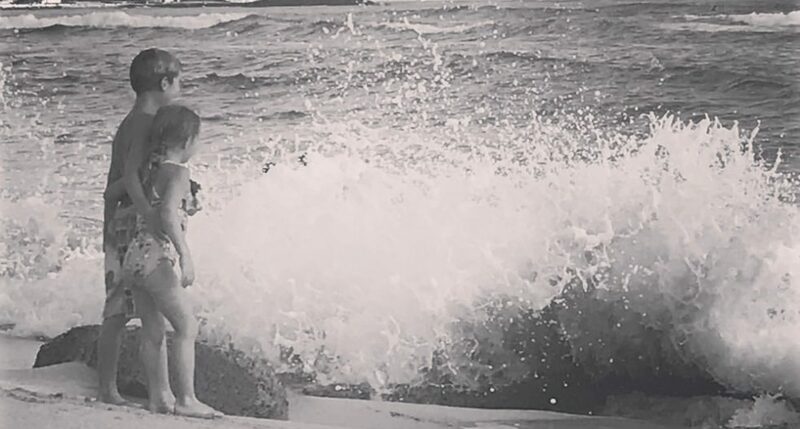 At the end of the month, we are renting a beach house on the North Shore for a few days with my parents and I’m looking forward to wrapping up the summer with some Vitamin Sea and prepping our minds for the new school year. Have you done everything you hoped to do? You still have a few weeks! What are you hoping to accomplish? My daughter still loves her children’s short story bible. It’s a bible that fits in their hand, but the size of a small dictionary, that has a page or two dedicated to stories with a picture. It’s easy reading and simple concepts even something the 5th grader loves. (still) My kids are exhausted from the school year. They just want to hang out and relax, watching lots of t.v. , some reading, and outings to kids bowl free, beach, and $1.00 movie summer series. Hang with friends by pool. And that’s it. They don’t want to do anything. 🙂 And we’re packing to move…SO it’s hard to coordinate. Okay! see you soon. Oh, and I just started a new series challenge. Maybe you might want to check it out? If you like challenges. That bible sounds really special! I can just picture her carrying it around in her palm! We haven’t made it to the dollar movies this summer. We should! My son got swimmers ear so we have been avoiding the pool and beach for a while (boo!) until the medicine kicks in! I’ll check out your challenge! Thanks! I miss school holidays – I used to have such fun with my boys and I too loved having then home, unlike many others who would count the days until school went back.. I just received the school supply list in the mail. I feel like I’m avoiding it. Not because I don’t want the shopping crowd (well, that too-ha!) but, I just don’t want to accept that it’s time for school so soon!!! !